The Broward County Sheriff's Office is seeking to apprehend two suspects who carried out an armed robbery at a MetroPCS location in Lauderdale Lakes. Detectives are hoping clear surveillance video would lead to the arrests of two men who took off with some iPhones in an armed robbery of a MetroPCS store in Lauderdale Lakes. The Broward Sheriff’s Office on Friday released over six minutes of footage showing before, during and after the robbery at the store located at 2460 N. State Road. The two men are seen casually strolling into the retail store just before 7 p.m. on Monday. One of the men starts walking toward the back of the store and pulls out a gun, pointing it at the employee behind the counter. The other man jumps over the counter and shoves the employee off her chair before he ushers her to the storage room. Another employee is seen in the storage room loading iPhones into a safe when the armed robber walks in and demands her to put the phones into his backpack. 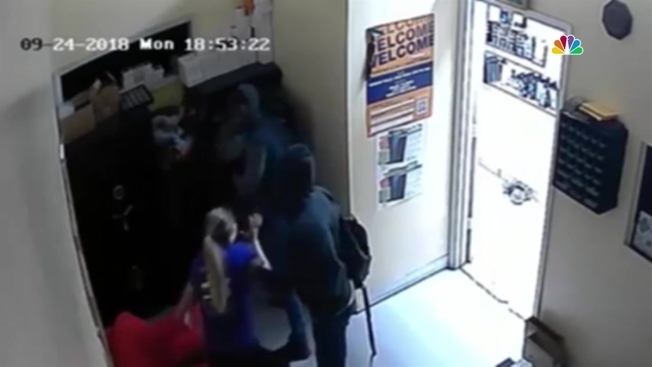 The second robber enters the storage room with the first employee and shoves her into a chair before they take off with the phones. Anyone with information should contact BSO Robbery Detective Trevor Goodwin at 954-321-4270. Anonymous tips can be submitted through Broward Crime Stoppers at 954-493-TIPS (8477) or online at browardcrimestoppers.org. Anonymous tips that lead to an arrest are eligible for a reward of up to $3,000.